Today, the New York State Quarter Coin remembers when the first electric current traveled from Niagara Falls to Buffalo on November 15, 1896. The possibility of compelling the falls of Niagara to furnish the city of Buffalo with light, heat, and power was for years the cherished dream of many an engineer who gazed with awe upon the tumbling waters of the great cataract. That the dream would become a reality before the end of the century was regarded as utterly improbable. Such, however, has been the liberality of broadminded capitalists and the perseverance of skilful engineers that even now a current of electricity, capable of developing 1000 horse-power, is leaping over the wires to the Queen City of the Lakes, and furnishing motion to hundreds of wheels along her busy thoroughfares. As the story of the harnessing of the tremendous energy of Niagara has already been told in these columns, it is only necessary for me at this time to tell how the electric current is brought over the twenty-six miles of wire to Buffalo, and what it is doing toward the inauguration of a new era in the commercial and industrial life of the city. The Niagara Falls Power Company, to whose enterprise we are indebted for the establishment of the greatest water-power plant in the world, obtained from the city of Buffalo, on December 16, 1895, a franchise granting it the right to introduce Niagara power into the city and make use of the streets for its transmission and distribution. Under this franchise the company contracts to deliver a 10,000-horse-power current to consumers in the city on or before Dec. 31, 1897, and an additional 10,000 horse-power each subsequent year for ﬁve years, or 50,000 in all on June 1,1901. The company was required to file a bond of $250,000 to carry out the provisions of the contract, and to pay the city two and one-half percent of its gross receipts for the thirty-six years covered by the franchise. Such was the confidence of the board of directors in the ultimate success of the project that they gladly accepted the terms of the franchise, and proceeded at once to carry out its provisions. It is gratifying to state that such was the enterprise displayed by the engineers and others in charge of the construction of the line between Niagara Falls and Buffalo that on November 15, 1896, six months before the time for the delivery of the first 10,000 electric horsepower had arrived, the company was able to send on 1000 horsepower as a sample of what it expected to do later on. The difficulties presented in the construction of a line of wires capable of carrying a 10,000-horsepower current at a pressure of 10,000 volts twenty-six miles were many. Such a line had never been put up before. Hence the engineers were obliged to work on the problems presented, assisted only by the experience of those who had constructed shorter lines for the same purpose. The contract for constructing the line was awarded early in 1896, and was completed in time, for the transmission of the 1000-horsepower current on November 15. The line is twenty-six miles long, and extends from the rear of the Niagara Falls Power Company’s transformer-house at the falls to the power-house of the Buffalo Street Railway Company in Buffalo. There are 2100 poles in the line, ranging from 35 to 65 feet in height, from 15 to 30 inches in diameter at the base, and from 9 to 10 inches in diameter at the top, set about 75 feet apart. At the top of each pole are two crossbars of hard yellow pine twelve feet long and four by six inches thick. Each of the cross bars will eventually carry six wires, but at present only three have been strung on the top crossbar. The cross bars are supported underneath by angle iron braces weighing twenty pounds each. Below is a standard six-pin electric-light arm, bored for two pins, which carries a private metallic telephone line. At the extreme ends of the long crossbars are tall steel pins which will prevent the wires from falling in case an insulator or tie-wire should break. To them is fastened a wire which will serve as a lightning-conductor. When completed the entire line will have a capacity of 20,000 horse-power, and each pole will sustain a weight of 1200 pounds of copper. The insulators employed were specially designed for the company. They are of the triple-petticoated type, and are so designed as to present an unusually large surface and uniform strength. Along the lower edge of the outside petticoat runs a gutter designed to draw away water on each side of the cross-arm. These insulators have been tested to resist an electric current of 40,000 volts. The overhead conductors along which the mighty force travels are of bare stranded copper three-quarters of an inch in diameter, and are composed of nineteen No. 10 wires. The transmission line, when within 4200 feet of its primary destination at the Buffalo Street Railway Company’s powerhouse, changes from overhead poles to an underground conduit. The line descends from the last pole to a small brick terminal-house, inside of which connections are made with the underground cables, composed of a stranded copper core, 350,000 circular mils in diameter, covered with 9/14 of an inch of pure rubber, two windings of rubber tape, and a coating of lead. The cables terminate at the transformer-house in the rear of the Niagara Street power-house of the railway company. This building is 16×20 feet, and is one story high. At one end of the single room it contains is a marble switchboard similar to the one at Niagara Falls. The cables are carried to this switchboard. In the centre of the room are three transformers standing on an air-tight platform. The lines are carried from the switchboard to the transformers, and from them to the converters located on the floor of the power-house above, from which point the current is ready for distribution over the lines of the railway company. The electric current undergoes several transformations before starting from the power-house at Niagara Falls on its trip to Buffalo. On leaving the big generator the three-phase-alternating current of 2200 volts passes through cables to the transformer house, where it is connected with two “step up” transformers of 1250 horse-power each, which raise the current to 10,700 volts. From the transformers the current passes to a switchboard, from which it starts along the pole line towards its destination. On arriving at Buffalo the current passes through the “step-down ” transformers, which steps it down from 10,700 volts to 370 volts. After these 370 volts of alternating current have passed through the rotary converters, it becomes 550 volts direct current, and is ready to be sent out over the electric-railway lines. The responsibility of the Niagara Falls Power Company ceases when it delivers the electric current at Buffalo. The distribution of the power is in the hands of a sub-company known as the Cataract Power and Conduit Company. The introduction of power from Niagara, which today is operating its leading street-railway lines, opens up almost limitless possibilities for the city of Buffalo. Already it stands sixth in the list of the great commercial cities of the world. What its position will be a few years hence, when the great cataract is delivering at its gates 50,000 electric horse-power-an amount sufficient to operate all the machinery within its borders, and to furnish light and heat to every building at a lower cost than has been known in any other municipality—no one can accurately predict. 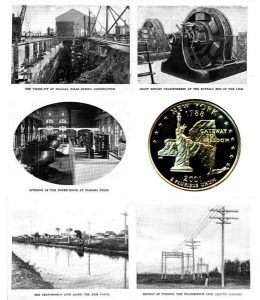 The New York State Quarter Coin shows with images of the early electrical system from Niagara Falls to Buffalo.